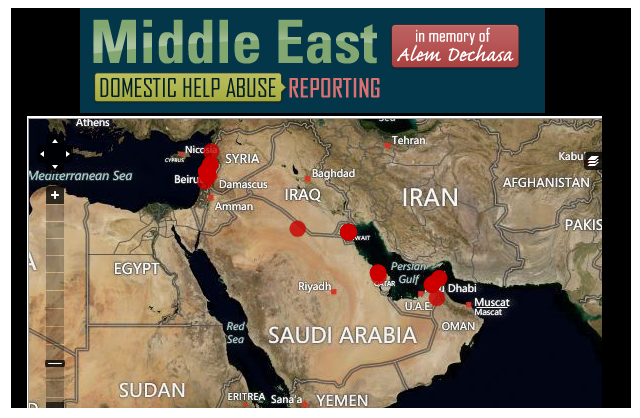 A website dedicated to the memory of Alem Dechassa documents & reports migrant worker abuse in the Middle East. New York (TADIAS) – The tragic death of 33-year old Alem Dechassa in Lebanon has unleashed innovative solutions by Ethiopian professionals to bring much needed attention to the plight of domestic migrant workers in the Middle East. Alem Dechassa died on Wednesday, a few days after her videotaped beating was posted on YouTube that showed her being dragged and pushed into a car outside the Ethiopian consulate in Beirut. Jomo said: “Anyone can report an incident via the internet or a smartphone.” An SMS function will also be added shortly so that abused domestic workers can communicate and report live incidents to the site. You can log reports at the website: https://domestichelpabuse.crowdmap.com. Our sister Alem Dechassa will not be forgotten. The initiative and the new website is Fantastic! It’s much needed and honors the memory of our sister Alem Dechasa in the most appropriate way! This is what I am talking about! I have been wanting to do a website for a live phone hotline for the victims or their friends to report abuse from anywhere in Real time. I am so happy to see what You already have done Jomo. I would love to collaborate with you with my idea instead of reinventing the wheel since you’ve already have the platform up and running. I will also send you a message through your website. We are witnessing the old and wise Ethiopian proverb: Dir Biabir Anbessa Yasir. Thank you Alem Dechassa. God bless your soul! This is great!! Thank you Jomo. I like it very much. They also need to reform the embassy system. The status quo is unsustainable. You deserve all respect for you guys who live in US for showing the credebility of Ethiopians who suffer around the world, specially for those who live in developing countries, thank you even the quiq reaction you showed for Ethiopians imigrant live Norway who face deportation, It whould be appreciated if more Ethiopian who live in the other part of the world follow the same foot step and show what we are going through for the rest of the world too. May God place your soul in heaven. REST IN PEACE OUR HERO. I am glad to hear this, good job! I want to tell you I love Tadias Magazine!! This is a very action oriented project and the founders should be thankful. This website should also be promoted on radios that are widely heard in Middle East, VOA Amharic, Oromifa, Tigrigna, Somali etc. German Amharic is also another outlet. I suggest the founder of the website to be interviewed on those radios and educate Ethiopians in Middle East and the rest of us how to use this excellent tool what I call our “314″,the morning no Ethiopian will forget, Alem Dechasa left us breaking our heart after we saw her brutally abused and her cry still disturb most of us and will remain with us for a very long time. The lion is roaring once again! You are not forgotten Alem Dechassa! I am so delighted to see this positive effort! I am rooting for all of you! I am with you! Good job. Very helpful and informative website. It’s very important to collect data in order to make convincing argument that the problem, in fact, is a very serious issue that needs to be eradicated! Jomo, yours is such a human act for you have thrown what you got to help bring the evil doers to the spot light. You deserve thousand thanks! No other but we are to blame if we simply let the inhuman acts continue to happen to our sisters and brothers wherever they are. Alem, I salute your beautiful soul. R.I.P ! I really want to thank Jomo Tariku for this profound step you took; by taking your and your family valuable time; it really needs a courage and willing to do such a great job. Well done! Stay blessed with your family!!! Good start, way to go!! This is an interactive tool where anyone with information can submit incident report. We call upon those concerned with abuse of Ethiopian domestic workers abroad to help in this venture by submitting incident reports that you may know. Just make sure there are no duplicates. If you see the incident is reported, no need to submit it again. Fellow Ethiopians, reacting with emotion & expressing outrage whenever such kind of tragedy occurs does not bring the desired change. Let us make sure the tragic death of Alam Dechassa is not in vain and change it to positive force that would help next victims or prevent future abuses. This interactive tool is one step toward addressing the problem. Hopefully, Ethiopian women organizations in diaspora and in the country would take further steps & lead the effort in demanding businesses making money from arranging such work abroad are investigated/vetted or bear responsibility for domestic workers’ welfare they send abroad. Furthermore we can demand that safeguards being placed in future contracts like the one negotiated now between Saudi Arabia & Ethiopia. Making sure that clauses are put in place in the contarct that allow domestic workers in distress seek help with social services organizations or better organize themselves as syndicates or self-help groups would go longway in preventing such abuses. Consultation with organizations like ILO & international NGOs having experience in such negotiations would help tremendously. More on our civic/political culture which allows such humiliation is to be posted on my blog soon. proud of the Diaspora. amazing stuff! “Divided We Stand United We Fall” Thank you everyone for voicing your concerns. Thank you JOMO. This gives me hope that we can overcome our economic disadvantage status by just coming together the way we did for Alem Dechasa, bless her soul. Poverty is relative, and the lack the necessities of life is not necessarily a hardship. Spiritual and social ostracism, physical and mental abuse, are what constitute the pain of poverty. Ayzon! Enashenifalen! Just a comic relief here. Ethiocyber need to change dat spliff. “Divided We Stand United We Fall” Say what? Thanks for the superb coverage of this tragedy. Great work! This work is great as it already shows a PATTERN of abuse of domestic workers across the Arab World! It is not just the Saudis or the Lebanese. And with more young girls immigrating now for better job ( the Saudi’s are already looking for 45,000 Ethiopian workers per month), there must be guidelines and rules for workers’ rights and better working conditions in place. Apparently, someone has made a documentary of Ethiopian girls going from small rural towns in Ethiopia to Dubai and the rest of the Arab world and what they face. Nightmares in Dreamland – Part 1, 2, 3 and 4. I meant to say “United we stand, divided we fall”great catch!apology for erroneous post (dyslexia). Thanks! Good job guys. I was present at the event in D.C. at the Lebanon Embassy A great collection photos and quotes that fully expresses how we feel, in the deepest sense, about what was done to our sister and hero Alem!!! Res in peace angel. I am so grateful for this website to map and report domestic help abusers. We are in the right track. We must not rest until we stop this senseless violence against women. Being abused in this manner is like being kidnapped and tortured for ransom but you will never have enough to pay off the kidnapper. I am glad that we are moving forward in the right direction. We have turned the table around. We are now watching you abusive employers!! Nightmares in Dreamland – and Part 5 also. To our dismay, the documentary clearly shows how the Philippino embassy in Dubai set up an alert center inside the embassy to help abused citizens in Dubai and how the Ethiopian embassy simply collaborates with local officials there instead of helping its citizens! Well – we have an embassy like that one in Beirut! This is what it is! I wonder if we even have embassies at all! It is sad – but that is where we are at! Dihinet adis ayidelem le’etyopiya – yeGid Mewared Gin Yelebinim! The problem can only be solved at home. The ROOT problem is in ETHIOPIA!!! The reporter’s latest Editorial says it all! A person who calls for revenge keeps his own wounds green. Evil is always devising more corrosive misery through man’s restless need to exact revenge out of his hate. Getting inside the mind of a terrorist is not the difficult at all. Human beings fabricate elaborate revenge fantasies. We’re not a particular species. Check out popular video games. Yes, way to go ! Great start if we don’t start, we wouldn’t have….. end. They must know we are human beings . Thank you, Tadias. I commend you for this inspiring work. crowdmaps played a revolutionary role in documenting Arab protests, various Amnesty International projects, the Haiti Earth Quake and many others. Among the many uses of language, two important forms are persuasive, data and Crowdmapping that is the aggregation of crowd-generated inputs such what has been done here. Proud of you!! It is very well done! Thank you. Excellent work. This website is one more tool needed to bring awareness of the tragedy that surround all domestic workers in the Middle East. I ask all of you to join me in signing the petition below so that we can be united to bring Alem’s abusers to justice. Working on a Vocational Academy project in Addis or any other major city in FDRE catering to contribute to the gradual elimination of slavery, exploitation, and abuse of the Ethiopian emigrant Domestic workers. The size of project in its early stage is around $1.5 million dollars. As a lawyer, I do not need administrative or legal counsel. I have contacts in Ethiopia, the Government and the Minister of Labor are on our side. We are inviting the following: Local Investors, Academic Staff, Owners of private land interested in partnership, College Administrators, and anyone with added value technical elements dealing with the hospitality and home economics professions. The essential factor in our concept is the relative fluency in bilingualism: French/English/Arabic Amharic (any combination). The Academy will train domestic workers to become professional career ladies, earn higher salaries, shield them with knowledge and seed experience, make them aware of their legal and human rights, and thereon contribute to their socio-economic development long-term upon return to Ethiopia. Experience earned, their career will qualify them to establish own small business, or work as House-Keepers in major Hotels, Cooks, Restaurants and catering businesses, Hospitals, Luxury home assistant-butlers (the list goes-on..). This project will take 18 months to be born. Training certificates and diplomas will range from 1-12 months (various grades). This is a semi CSR project. God bless you Jomo with health, abundence, comfort and safety. The moaning and crying of Alem Dechassa is still ringing in our conscience probably forever. Alem was crying to Ethiopians to save her from her suffering and pain caused by the assault of the brutal Lebanese, but we Ethiopians failed her. Above all, the Ethiopian consulate diplomasts were looking down at Alem through their windows like a hollywood movie when she was tortured, cried, wept and draged in the street. This was the worst moment where I felt how we Ethiopians are coward, cruel, heartless, no civil courage and sense of solidarity for their fellow Ethiopians. Jomo, you have made a difference and for that let God bless you again and again. Let the soul of our poor sister Alem rest in peace forever. I must say that I have been extremely impressed by this new sense of purpose and unity demonstrated among Ethiopians inspired by the passing of our fellow citizen Alem Dechassa. What I have witnessed you guys pull off is not very easy. It’s commendable to the highest degree!!! Tackling old problems from a new angle requires creative imagination and marks real advance in our community. VERY PROUD!! We cannot solve our problems with the same thinking we used when we created them. That’s why I am so happy by the innovation. Kudos Jomo! This is a blessed idea brother. i will be coperationg with you in all possible ways since i am part of this unlucky ethiopian community in Riyadh. Thank you Guys and thanks jomo. We will have to repent in this generation not merely for the vitriolic words and actions of the bad people, but for the appalling silence of the good people. Freedom is never more than one generation away from extinction. We didn’t pass it to our children in the bloodstream. It must be fought for, protected, and handed on for them to do the same. My fellow citizens: what happened in lebanon on our sister is unspeakeble, barbarism at its peak. It is difficult to imagine, much less to see it like a movie on TV. What is equally disgusting is what the so called “Ethiopian Emmbassy” officials said:. They said, “we r diplomats we cant go out and defend citizen being tortured to death at the gate of the embassy.” here it is not a question of bad of good govt. Do we rather have a govt worthy of the name? It’s very, very sad. I feel so sorry for the humiliation Alem suffered. This bad situation needs to be changed.